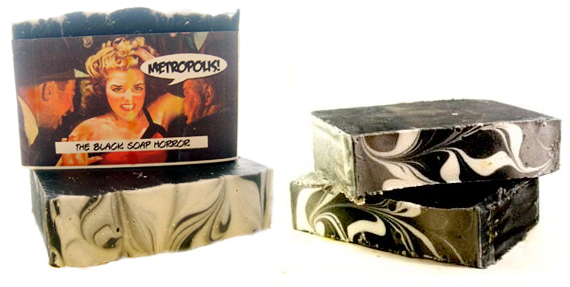 product review : the black soap horror – Metropolis Soap Co. When I was asked by the Metropolis Soap Co. if I wanted to review their products, I was intrigued by their kitschy depictions of dames in distress and other scandalous scenes (I admit I’m a huge sucker for packaging) on their products. I really like that all their products are made by hand in the US and are vegan and cruelty-free, I also like that they have a good sense of humor! When I opened the package from Metropolis, I was delighted to receive a full size bar of The Black Soap Horror which is black and white in color. I do giggle a little at black items, as it does appeal to my gothy side! They couldn’t have picked a better soap for me, as I instantly loved the musk fragrance which was calming, did not over power my senses, and I could easily identify with. Since I’m a bath gal, I couldn’t wait to soak my ole’ bones and lather up with The Black Soap Horror. Some highlights of my bathing experience were; the soap bar lathered up nicely on my skin and the suds rinsed off completely and there was no residue left behind. I instantly felt moisturized after rinsing off and knew I wouldn’t need to use lotion after my bath. I enjoyed that the fragrance was still on my skin even after toweling off and I could pleasantly catch sniffs of the soap as the day continued. I like that the soap is not over fragranced, leaves me feeling moisturized all day and you get a huge bar of soap for your buck! I’m looking forward to ordering a few bars for myself and for possible holiday gifts. Check out all Metropolis Soap Co products at www.metropolissoap.com.